Tis the season! So, I thought I’d kick the week off with an awesome giveaway! The giveaway is from one of my favorite sources for journaling, travel and photo accessories. 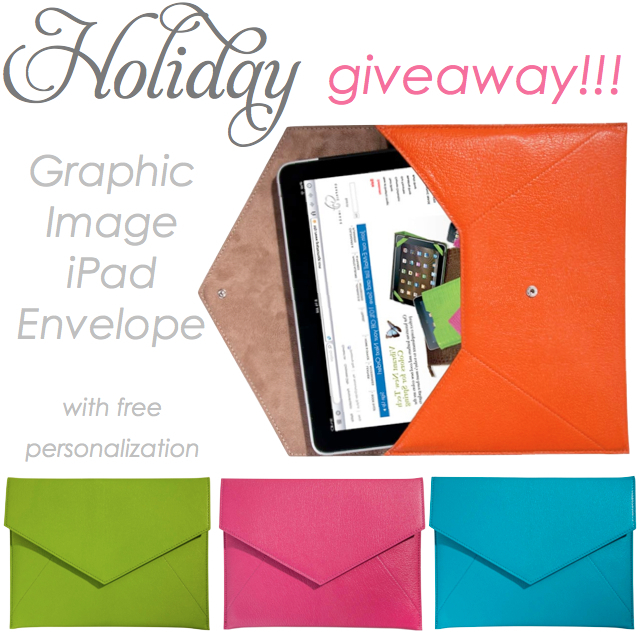 Carry your iPad with style and enter to win a hip free personalized iPad envelope cover. They are functional and stylish at the same time…who wouldn’t like that!? Simply visit the Graphic Image website and comment on this post below with a link to your favorite item! Tweet a link to this giveaway! You must mention @GraphicImageNY & @Hellosplendor and leave an additional comment below. Like Graphic Image on Facebook and leave an additional comment below. You have until this Friday, December 9th, at midnight to enter! Whether you win or not, Graphic Image is still giving all Hello, Splendor readers a chance to save! From now until January 9th, you can get 20% OFF their entire site using promocode HELLO at checkout!! I’ll be taking advantage of this deal to complete my holiday shopping, for sure!